Queen bed, rate is for 2 people. HD Digital TVs and DVD player, FREE hi-speed broadband, Plunger coffee, Gluten Free breakfast available. Rate is for two people. Additional adults/children $20 each. Bedding configuration is 1 Queen and 1 single. FREE hi-speed broadband, Gluten Free breakfast available, Plunger coffee, HD Digital TV and DVD player in room. Rate is for two people. FREE hi-speed broadband. Additional adults/children $20 each. Plunger Coffee, HD Digital TVs and DVD player. Gluten Free breakfast available. Overlooks the mighty Manning River the only double delta river (a river with two outlets) in the Southern Hemisphere and one of only three true deltas in the world Spacious room with private balcony and lovely views across 30m of parkland to the Manning River. Free Wifi, HDTV/DVD, reverse cycle aircon, 8 Foxtel channels,microwave, tea/coffee/plunger coffee, queen bed and single bed, workbench & desklamp. Rates are for 2 people. Extra person $20. 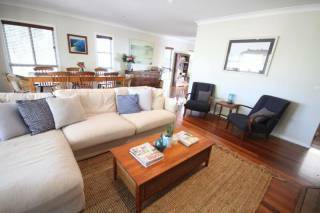 Kitchenette, Bath/shower, Beautiful views over Manning River. Free hi-speed Broadband, Plunger Coffee, HD Digital TVs and DVD player. Gluten Free breakfast available. Separate bedroom. Rate is for two people. Additional adults/children $20 each. Free hi-speed Broadband, Plunger Coffee, HD Digital TVs and DVD player. Gluten Free breakfast available. Rate is for two people. Additional adults/children $20 each. Bedding configuration is 1 Queen and 3 singles. FREE hi-speed broadband, Gluten Free breakfast available, Plunger coffee, HD Digital TV and DVD player in room. Located on the banks of the Manning River, Midlands Motel offers individually-styled rooms with free Wi-Fi. All rooms include a microwave, refrigerator, satellite TV and DVD player. Guests enjoy an outdoor swimming pool. 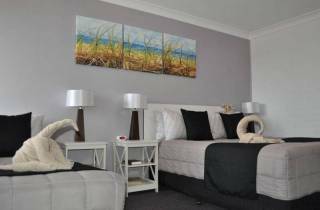 Midlands Motel Taree offers executive suites with private balconies and self-catering apartments with full cooking facilities. Free car parking and flat-screen TVs are provided. Guests have direct access to the riverside parklands at the rear of the property. Laundry facilities are available. Breakfast can be served to the rooms each morning. Midlands Motel is 3 minutes' walk to many local restaurants. The beaches of Harrington, Old Bar and Crowdy Head are between 15 and 30 minutes’ drive away. It is 7.4 km from the northern highway exit and 4.8 km from the southern highway exit. Cancellations or changes to bookings for this room must be made at least 24 hours prior to the check in date or you will be charged the full amount of the first changed or cancelled night. Credit card details required as deposit to secure booking. Full payment expected on arrival. Directions from South - Take the Taree exit off the Pacific Highway and follow the signs in to Taree. Immediately over the bridge turn right at the traffic lights into Victoria Street. Proceed through to the town centre and we are situated two blocks further on the right next to KFC. Directions from North - Take the Tariff exit off the Pacific Highway. Proceed through Cundletown and right into Taree. We are situated on the left next to KFC.